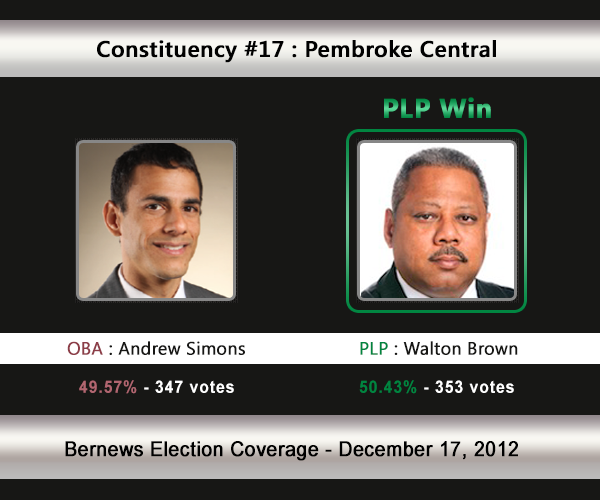 [UPDATE Dec 17: Election Results] Walton Brown [PLP] has defeated Andrew Simons [OBA] in C#17 Pembroke Central. The incumbent was Wayne Perinchief [PLP]. Whoever wins this area will be a new representative for the people of Pembroke Central, with incumbent Wayne Perinchief [PLP] moving to Constituency #8: Smiths South.Walton Brown will stand for the PLP, while Andrew Simons will stand for the OBA. In the 2007 General Election. Mr Perinchief won 56.5% of the vote vs the UBP’s Austin Warner [39.64%] and Independent Harold Darrell [3.09%]. In the 2003 General Election, Wayne Perinchief [PLP] won with 55.09% of the vote against Leonard Santucci [UBP] who received 44.91%. 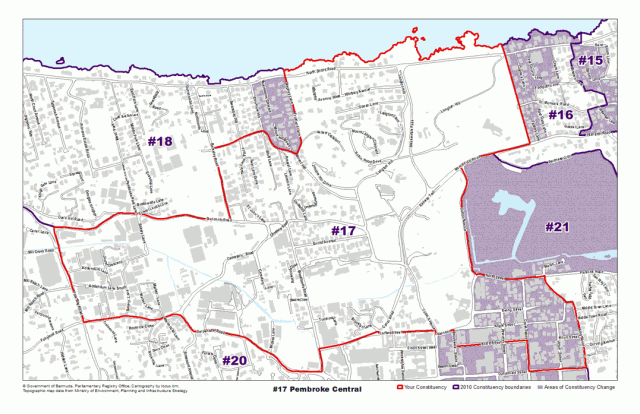 Areas Pembroke Central compromises of, or is located by, include St. John’s Road, Berkeley Road, Mount Hill, North Shore Road, Crane Lane, Dutton Avenue, Cedar Avenue, Canal Road, Woodlands Road, Serpentine Road, Pitts Bay Road. Walton Brown is a political scientist and well known social commentator and analyst. He taught politics and history for twelve years at Bermuda College and later entered the private sector full time as founder and president of Research Innovations. Mr. Brown has a keen understanding of the social and economic conditions on the island and its place in the global arena. He is a life-long resident of Pembroke and is sensitive to the needs of the community. Walton was taught the importance of education and given passion for our country by his parents, Walton Brown Sr. and Barbara Brown and his paternal grandfather W G Brown. Mr. Brown is an alumnus of West Pembroke School, The Berkeley Institute and Bermuda College. Walton earned his Bachelor of Arts (Hons) in Political Studies from Queen’s University and his Masters Degree in Political Science from York University, both in Canada. He has authored many academic papers and published extensively in academic and mainstream media; he has also made numerous presentations at conferences throughout Europe, the Americas and the Caribbean. Mr. Brown recently published his first book, “Bermuda and the Struggle for Reform: Race, Politics and Ideology, 1944-1998″ which provides tremendous insight into the making of modern Bermuda. As your candidate, Walton is committed to addressing the concerns you raise in the constituency: issues with BELCO, drug activity, road safety issues, security for seniors and others that you will share with him. He pledges to listen attentively and to respond to your concerns. His pledge is to be available for you and, living on the boundary of the constituency, will in the area daily. Walton is Chairman of the Bermuda College Board of Governors, a member of the Permanent Arbitration Tribunal, weekly columnist for The Royal Gazette and radio host of Bermuda Speaks. He is a former expert regional advisor to the United Nations Decolonisation Committee (1990-2005). Mr Brown is the proud father of three sons: Jarrod, Taryq and Dominic. I grew up in Spanish Point, attended West Pembroke Primary School, and graduated from the Berkeley Institute before going to the Hotchkiss School in Connecticut. I attended Stanford University in California as a Bermuda Government Scholar and graduated with a bachelor’s degree in computer science and a master’s degree in chemical engineering. For two years I worked at EMC, a major technology company in Boston, before moving back to Bermuda five years ago to work in reinsurance. I was called up by the Bermuda Regiment when I got back and served as an officer. As an officer, I was responsible for the welfare of my troops. I saw them struggle to find jobs, pay for health insurance, negotiate the court system, and keep a roof over their heads. I saw them carry the weight of unaddressed trauma. Unfortunately, as our country has slipped into debt, these issues have become much more common. I am running to represent you in Parliament because I want to reorder our spending priorities to focus on preventing the problems my soldiers face, problems shared by families throughout the community. The current Progressive Labour Party government has failed the very Bermudians who struggle the most. They have not been careful with our money.